Why does the tortoise win and the hare lose? One reason is that the rabbit, fueled by confidence and perhaps too much caffeine, slacks off when he thinks he’s ahead. But perhaps more significant, the tortoise, while slow, believes in himself, understands his competition and sets a perfect pace. 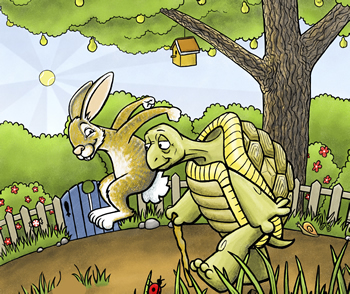 In many respects the tortoise displays keen emotional intelligence while the bunny is immature. It’s our ability to deal with others and to understand their emotions as well as our own. It affects all aspects of our professional lives. If we deepen our own emotional intelligence, it arms us with the ability to withstand the unrelenting, 24/7 stressors in our lives. What are some ways we can sharpen our emotional intelligence? One way is to try to look at the situation you’re facing through the other person’s eyes. Examining a problem from all angles helps you remain calm. In fact, good listening skills may be the most important and least-discussed tool in your professional toolkit. Effective listeners remain calm, sort facts from opinion and respond effectively in the face of disagreement. While it’s human nature to listen defensively, we can train ourselves to ask questions dispassionately and gain useful insights instead of tuning out as we plan our reply. Upon reflection, if the emotionally intelligent individual determines that an apology is warranted, she makes one quickly and effectively and moves on. No looking back, second-guessing or dwelling on negativity. Another way to hone emotional intelligence is to prepare for a given situation with both a Plan B and even a Plan C, remaining calm and focused no matter what happens. In business situations this approach will prove your worth repeatedly to supervisors and clients. Unless an immediate decision is required, emotionally mature individuals aren’t shy about asking for time to think things through logically and systematically. Bad habits – including lazy communication – compete with emotional intelligence. One example is the use of passive language. State your case directly and clearly. Take ownership of the message. Emotional intelligence, author Travis Bradberry says, is the cornerstone of mental toughness. Confident people are flexible. They learn from their mistakes, then let go of them. They embrace positive change. They have little trouble saying ‘no.’ They let go of grudges and celebrate the success of others. They even welcome failure, because they know that it is inevitable on the road to success. By remaining unfailingly positive, emotionally intelligent individuals display the enduring assurance that inspires others to emulate their effective habits and mirror their winning attitude.